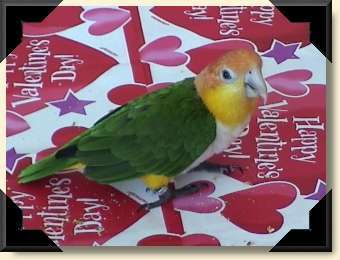 Pawl E. Parrot is my name, I'm a sweet little Valentine, born February 3, 1999. I am two years old and take two showers a day. I love sweet clementines, grapes, and fresh veggies, but those little black berries on the new Yorkie puppy's faces intrigue me the most. My favorite game is hopping across the table to chase dad's fingers till I pounce on them with my feet. Then I roll over on my back for some toe wrestling. Sometimes I feed the puppy's too. I rule the loft of my home overlooking the great room at Lake Bella Vista. I live in Rockford, Michigan with Jane and Larry. Hello, this is our baby, Jellybean. He's definitely a born entertainer!! Every morning he stands in front of the radio and whistles his heart out. He'll whistle to just about anything, but his favorite is LeAnn Rimes. He can hit all the notes, the little doll. He loves to roll over and lay on his back to play dead. (may I say he's very good at it!) He keeps us all entertained by whistling the umpa lumpa song from Willie Wonka and the Chocolate Factory. And if he thinks we need some cheering up, then he whistles "cat calls" to us. (woowoo) He's always finding something new to get into. Well, if he's not showing off, then he's cuddling!!! Thanks Gloria for our little bundle of joy! Your services were Excellent!!!! We cant wait to see what Jellybean will surprise us with next. Jellybean lives in Pennsylvania with the Schmitt family! Athena arrived at Sea-Tac Airport after an 11-hour flight from Florida, and she arrived chipper and friendly and alert. She was delighted at her new home and at the calls from three other Caiques and assorted macaws and conures, but not as delighted as I was with her. I'd read a lot of good things about Gloria's birds but I was nevertheless amazed at this one. Athena is beautiful, friendly, trusting, and healthy. She bonded to me at once and will stay with me all day if I let her. Athena lives in Washington state with Chris. I was born on 27 Apr 98 and named myself Caper. Heck, I'm always dreaming up some caper to pull off, so it seemed appropriate. I'm spoiled rotten, and wouldn't have it any other way (hehe). Just like all my cousins, I love playing and eating, and I always try to get my own way. Life is good here in Georgia with Candy, and I hope to continue playing on my rings by the window, and watching the world go by. If something is outside that I don't like, I'll growl and it'll go away - eventually. Hello Everyone! My name is Bandit (my mom likes to call me Bandi cuz I'm a little girl!) 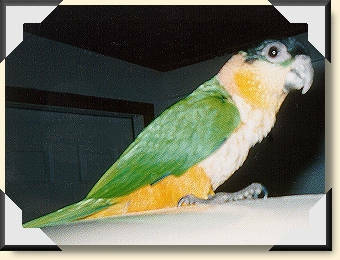 My hatchday was 4/9/00. My new mom and dad came to pick me up from Gloria's on 7/14/00. 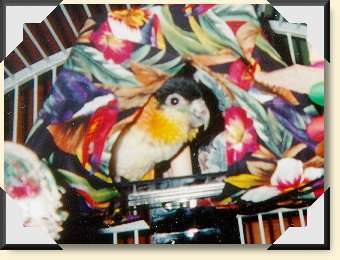 I play with ALL my toys and love sleeping in my Birdy Condo tent! I heard my mom say I am eating she and Dad out of house and home (I wonder what that means...?!) :) My favorite is grapes (of course!) I am already trying to talk. I can say "Up!" And I'm also learning to mimic my other 2 fid-siblings. I can make great kiss-smacking sounds! My dad made us fids an outdoor shower on our screened-in patio, I particularly LOVE jumping and splashing in the puddles below!! I am on the move til bedtime, then I love to cuddle and make bappy-talk! I live in Southwest Florida with Lin and Matt. Thanks for reading about me!! 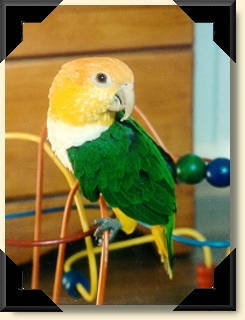 Gloria shipped Joey to me in January 1999 when he was 6 months old. 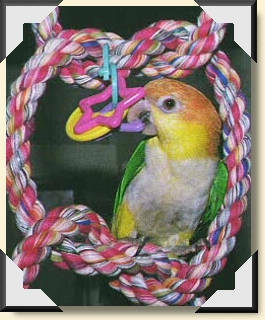 He is a bundle of energy and loves to play with his colorful variety of toys. He has a huge appetite and eats everything offered to him - fruits, vegetables, grains, legumes, seeds and nuts. No finicky eater here! 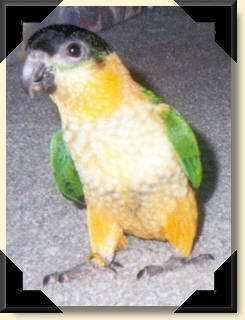 Joey especially loves his head scritched and will raise his feathers so that we can really give him a good scritchin. While he is often busy playing with his toys, he is also very contented to just sit in my lap and preen and be scritched for a long time. 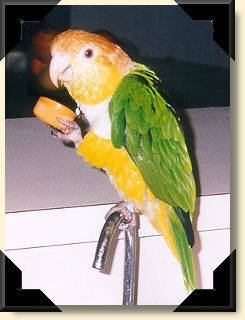 He is my little clown bird and so sweet and gentle. Casey charms everyone with his outgoing personality, and loves to entertain with his acrobatic antics. 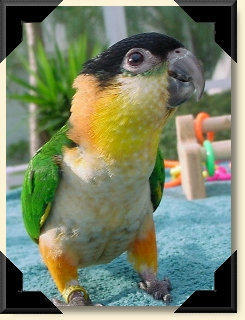 Always a happy little parrot, Casey starts each day enthusiastically singing! He really likes to be petted and kissed, and he loves to snuggle. He enjoys exploring new things and lying on his back to play. He brings a lot of love, joy, energy, and excitement into our home. Casey lives in Florida with Deb. Excuse me while I take a sip of my OJ. Every morning while Mom fixes food for the seventeen kids she has acquired, we have our breakfast together. I share my home with all the others but they all know I rule the roost. 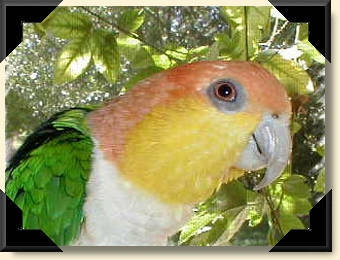 I am Bacardi and I live in Pembroke Pines, FL with Mary Ann Pugh. And here's Lenny... He's about to take his death defying leap to the floor where he will make his way to the kitchen. Lenny is 6 months old and lives with Bob & Petra Smith in west central Florida. 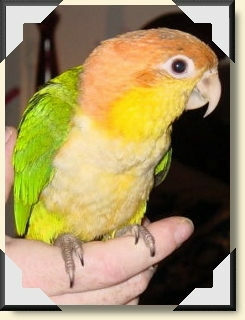 He is a good companion to Squiggy, a White-belly Caique. Spike starts the day when he makes his exit from his happy hut each morning, looks up to me with his unique expression as if to say "whats to eat?" He is a little super star with a great personality, loves to give kisses, cuddle, explore new toys, a great player. He struts around like a king bringing sunshine into my life each day. He is truly in a league of his own. Spike lives in New York with Linda.